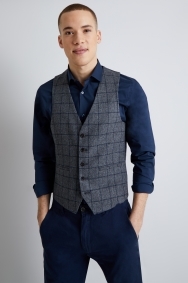 This windowpane waistcoat from Moss London embodies the best of traditional tailoring with modern style. It’s cut to sit neatly against your torso, and the rich charcoal and navy check is versatile enough to compliment a range of outfits. With its wool blend, it’s also designed for warmth and resilience. Keep it simple with a slim fit navy shirt and trousers, or team it with the matching jacket for a sophisticated look. 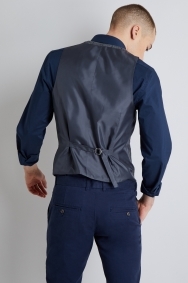 Great waistcoat, ordered specially for collection from my local store. Smart but could be dressed down for a casual look.